Our Remington YMCA is up for nomination in ArchDaily’s annual Building of the Year Awards. Readers can nominate and vote for the project from February 18th to March 4th. The winners will be announced on March 12th. ArchDaily is tasking its readers with the responsibility of recognizing and awarding the projects that are making an impact. Readers will first nominate buildings for the shortlist in fifteen different categories, followed by a vote for the winners in each category. Our Remington YMCA project in the Sports Architecture category provides state-of-the art recreation and wellness facilities for families in the surrounding residential developments and workers at the surrounding businesses centres. It includes a multi-purpose gymnasium, fitness area, childminding, public library, and aquatic centre. The aquatics includes leisure and competition pools, a hot tub and sauna. Shane Homes YMCA at Rocky Ridge Wins Copper in Architecture Award in NYC! We’re elated to announce that the Shane Homes YMCA at Rocky Ridge has won a 2018 North American Copper in Architecture Award! GEC’s David Edmunds accepted the award at the NAICA Awards Ceremony in New York City last night, which recognizes North American building projects that use copper to create beautiful and innovative buildings. 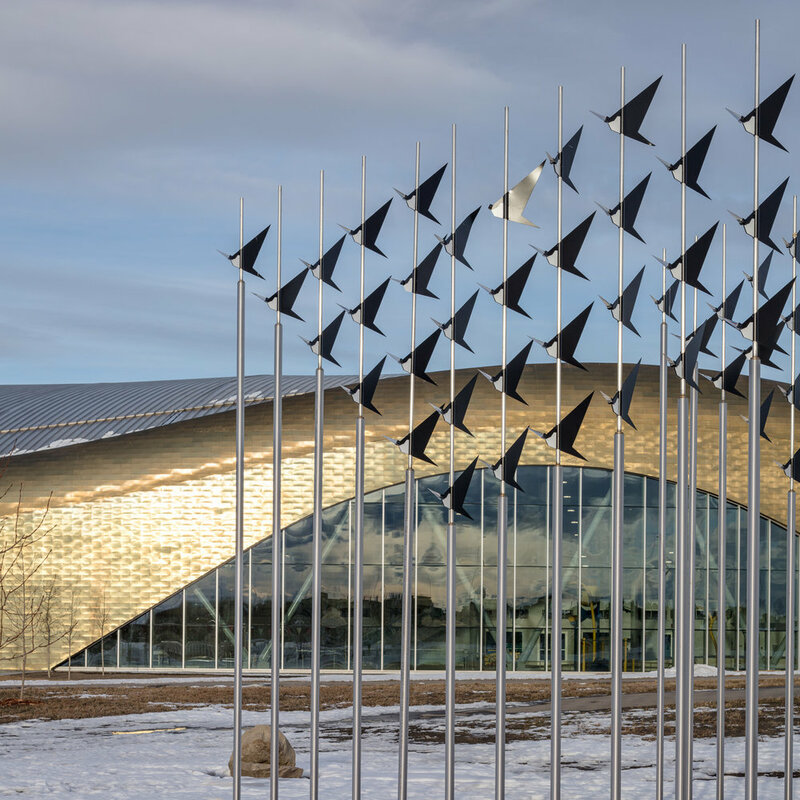 The Shane Homes YMCA at Rocky Ridge prominently features over 62,000 square feet of copper, giving the building its striking reflectiveness and characteristic hue.